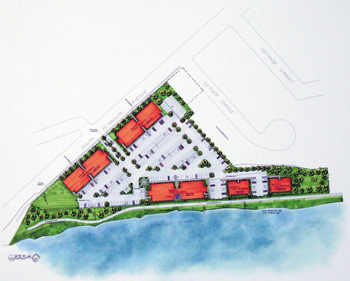 An artists' rendering of the complex from the parking lot, facing the river. Click to expand. The Riverview Apartments are a University of Rochester residence hall for undergraduate upperclassmen located in the Plymouth-Exchange Neighborhood, bordering the 19th Ward. They opened in Fall 2008 and consists of 120 fully-furnished units ranging from two to four bedrooms. The five buildings are between three and four stories high. Because the apartments are new, they offer amenities not available in older dorms, such as air conditioning and separate living rooms and kitchens. In the summer months some of the apartments may be used for conferences and other residential programs. Each building has laundry and vending facilities. The apartments are located less than a ten-minute walk over the pedestrian bridge extending from Plymouth Avenue to the UR River Campus. They are also served by the Green Line shuttle bus, which is free for UR students, staff, and faculty. The parking lot accommodates roughly 300 cars. The Riverview Apartments are part of the University of Rochester's extensive Brooks Landing Project. The groundbreaking ceremony was held on June 27, 2007.